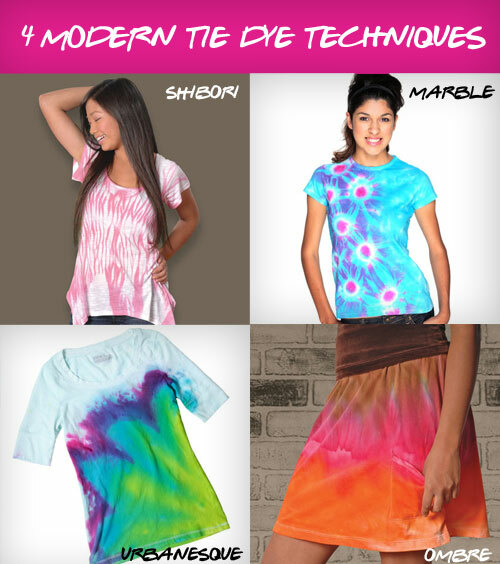 Are you looking for a totally different way to tie dye? If you are ready for a new tie dye challenge, then here are 4 techniques to try to get the lastest fashion-forward looks! And they are just as fun and easy as the classic styles. They are ombre, shibori, urbanesque, and marble. Here’s how you do ’em! All of these instructions are for the surface shown in the above photo; however, you can get the same look using different kinds of surfaces, just follow the instructions! 1. Prewash shirt to remove sizing. Do not use fabric softener. 2. Cover work surface with plastic tablecloth. Lay damp shirt on prepared surface. 3. Wearing plastic gloves, add water to Fuchsia dye bottle to line indicated on bottle. Replace cap tightly and shake until dye is dissolved. 4. Place the PVC pipe at the top of the damp tee then roll tee around pipe, rolling down to the bottom of shirt. Scrunch fabric tightly around pipe. 5. Squeeze Fuchsia dye onto scrunched shirt, making sure to rotate pipe if necessary to cover shirt from top to bottom. 6. Unwrap shirt from pipe then cover with plastic tablecloth and let sit 4 to 6 hours. Wash in a large load of water with a small amount of laundry soap and dry in dryer. Here's a video also showing this technique! 1. Wet shirt and wring dry or place in washer on spin cycle. 2. Cover work surface with Surface Cover™ then place shirt on surface and smooth with hands. 3. Place a marble inside front of shirt then tightly rubber band. Continue to add marbles where desired. 4. Wearing gloves from kit, fill Turquoise and Fuchsia dye bottles with water to line indicated on bottles. Shake until thoroughly mixed. 5. Squeeze Turquoise onto shirt, avoiding marble sections and carefully lifting shirt to dye back if needed. 6. Replace lid of Fuchsia dye bottle with sprayer from kit. Test on a paper towel, then spray top of each section of fabric with marble, letting overspray blend with Turquoise dye to create Purple color. 7. Let set for 4-6 hours. Carefully cut off rubber bands and remove marbles then wash in washer with small amount of laundry soap. Dry in dryer. 1. Prewash fabric to remove sizing. Do not use fabric softener. 2. Cover work surface with trash bags or plastic tablecloth. Lay damp fabric on prepared surface. 3. Wearing rubber gloves, add water to the Turquoise, Lime and Fuchsia dye bottles. Replace caps tightly. Shake until dye is dissolved. 4. With the shirt lying flat on tabletop, squeeze Lime dye in an abstract flower petal design. Refer to photo. 5. Squeeze the Turquoise dye onto shirt, bordering the Lime flower petal design. Repeat step with Fuchsia dye bordering the Turquoise portion. 6. Cover fabric with trash bag or plastic tablecloth. Let sit 4-6 hours. Wash in a large load of water with a small amount of laundry soap. Line dry. 1. Prewash skirt to remove sizing. Do not use fabric softener. 2. Cover work surface with plastic tablecloth. Lay damp skirt on prepared surface. 3. Wearing plastic gloves, add water to dye bottles to lines indicated on bottle. Replace caps tightly and shake until dye is dissolved. 4. Squeeze Brown dye on the top portion of skirt, Fuchsia in the center section and Orange on the bottom section. Refer to photo. 5. Cover fabric with plastic tablecloth and let sit 4 to 6 hours. Wash in a large load of water with a small amount of laundry soap and dry in dryer. Here's a video showing the Ombre technique! Are there any tie dye techniques you've done that are different from the norm? Tell us about them! I always like tie dye shirts but not in so many colors. One or two colors are enough for making right combination. Thanks for sharing these fantastic ideas with us. It is really good to see these stylish tie dye shits,Nice colors,nice combination.I love to wear tie dye shirts.Thanks for sharing this idea.